Visit our website at www.profaw.co.uk where you will find more information and where you can sign up for the course. Watch a series of short videos, answer knowledge review questions and complete the test. All courses include a student resources section to download the free student manual and many other downloads and links. 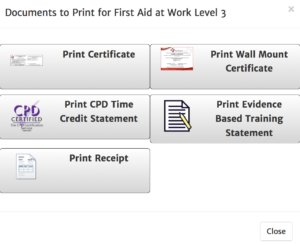 On completion of the online part you can instantly download and print your completion certificate. Because free downloadable evidenced based learning statement and Certified CPD statement are included, therefore ProTrainings course are comprehensive.